The Brewer Witches celebrate their first-ever state title in baseball at Mansfield Stadium in Bangor. It’s easy to forgive Zach Steiger for his eagerness to take baseball practice outside. 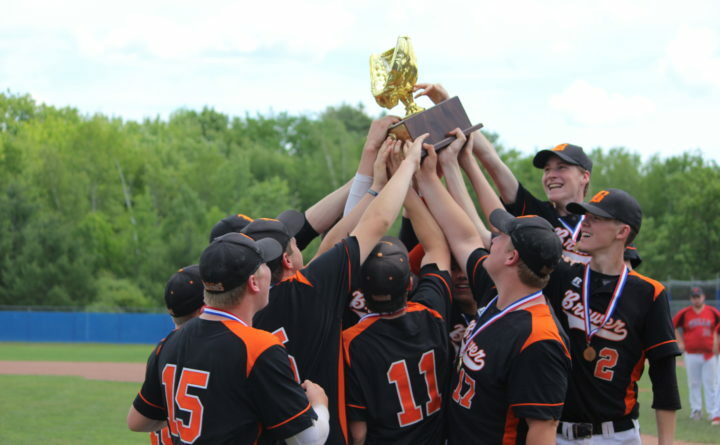 The senior first baseman was sidelined last spring after shoulder surgery as his Brewer High School teammates captured the program’s first state championship in the sport with a walk-off 3-2 victory over Wells in the Class B title game. Now comes Steiger’s chance to help the Witches position themselves for what they hope is another postseason run — if only they can get started. Brewer lost six players, including the bulk of its pitching staff, off a team that finished 15-5 but has 30 prospects out for the sport this spring — 13 on varsity and 17 on the junior varsity. Tenth-year head coach Dana Corey hopes to rely on the returning senior battery of pitcher-third baseman Levi Williamson and catcher Andrew Kiley along with some promising younger arms to provide the foundation for a new pitching staff that will keep the Witches competitive during their second season of Class B play. The leadership of Kiley, Williamson and Steiger likely will be pivotal in Brewer being able to maintain its standing against a slate of regular-season opponents that are armed with the additional motivation of wanting to knock off the defending state champions. Much of that work must wait until the Witches and other teams in the area finally can get on their now snow-covered — or at least soggy — diamonds. And the regular season is fast approaching. Brewer’s season opener is April 18 against Gardiner on the artificial turf at Kents Hill School. In the meantime, much of the Witches’ practices, which are largely confined to the gymnasium, are focused on the more strategic elements of the game. “We go over cutoffs, what to do on base hits, trap plays, bunt situations, offensive and defensive first-and-third situations, rundowns. Then when we get outside and there’s more space it all slows down for them a little bit,” Corey said. For Steiger, that readiness includes strengthening his throwing ability after initially injuring his right shoulder during the 2017-2018 ice hockey season and then reinjuring last fall it while earning All-Class B North recognition as a linebacker for Brewer’s football team. “That’s big for me: Getting my shoulder back in throwing mode,” he said. “It’s different being inside, you don’t get a good gauge on what you can fully do because it’s not the full length.